No, they do not: Silly old heavy/obsolete design. All my bikes have similar drop outs with 126mm spacing. Before every ride, check tire pressures and QRs, kind of a common sense thing, rear wheel has never budged. Not a designed flaw, just how it was done back when. Is there any reason the drop-out should be horizontal? Most of the time, no. It does make a frame more versatile, i.e. it's easy to set up as a single-speed. I spy a Campagnolo Nuovo Grand Sport adjuster in front, and a genericish Shimano one at the back. The wing end of the Q/R wouldn't happen to be squared off Campagnolo Triomphe, would it? That would be the one QR that I can distinctly remember having this identical issue with. Those things didn't bite well at all. long answer- horizontal dropouts are still useful for single speed and fixie bikes since the chain can easily be tensioned properly. horizontal dropouts were(are?) useful on bikes all over the world that are single speed and use fenders since chain tension and fender clearance can be adjusted. Since many bikes were and still are single speed, it can be useful. for a feared road bike though?...vertical dropouts work fine and the wheel attaches easier since there is more clearance. Woa! Good eye. I had to replace the rear wheel at one point, and had a 105 on there. I think they must have confiscated the original skewer, which I never even noticed. That makes me feel a bit better about replacing it with something more robust. Methinks that the Q/R on there now is whatever was on the replacement wheel. They may have "saved" that rear hub, though one of the LBS I frequent chucks wheels out to the garbage in back. Picked up some decent dual-walled MTB wheels w/stainless spokes an 8-speed cassette for free last week. The catch? 10 broken spokes; 5 per rim. Bought some replacements and they seem to be truing up nicely. Would this work better, and would it look ok? I think this was done at an REI bike shop in suburban Chicago sometime around 1995. (I was living in Cambridge and had this thing back home in the USA and would ride it then. I trashed the rear wheel). and then you can get it nice and snug. Last edited by wgscott; 04-08-19 at 10:11 PM. "What customer doesn't want back becomes free parts for us," say mechanics. I have no idea, but IMO just get an Ultegra QR and be done with it. They will hold. Old school internal cam. Lever should begin to engage at about perpendicular. You can be a little more slack in the front wheel. Kinda depends on your size. Once in a blue moon even old internal cam campys would slip on horizontals BITD. Usually if it was a big torquey rider who got a bit to slack tightening the lever, and then took off hard from a stop sign. Horizontals were handy for converting to fix in winter. Since no one does that anymore, not much point. If it's an external cam, there's yer problem. If you are aware of the issue, and you have one of the better external cams, they'll work with horizontals if you remember to keep them well lubed and semi crazy tight. I did that for a while, then forgot, once. Oops. Went back to internal cam and everything is always OK now. Why worry. No. It is internal cam. Vertical dropouts are hardly new. 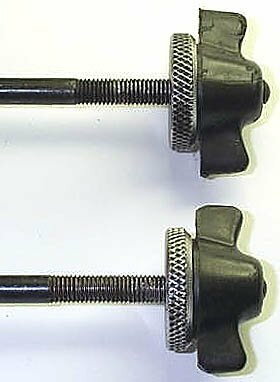 Herse/Singer/Goëland/Routens/Charrel/Taylor used them so that a fat-tired wheel could be removed from under a fender without letting the air out of the tire. Actually invented in pre-war France, like a lot of the other "new" bike stuff to come to market in the past 30 years. I use 126mm quick releases on 130 and even 135 wheels all the time. It's only a problem if it isn't threading through the whole threaded part of the nut. 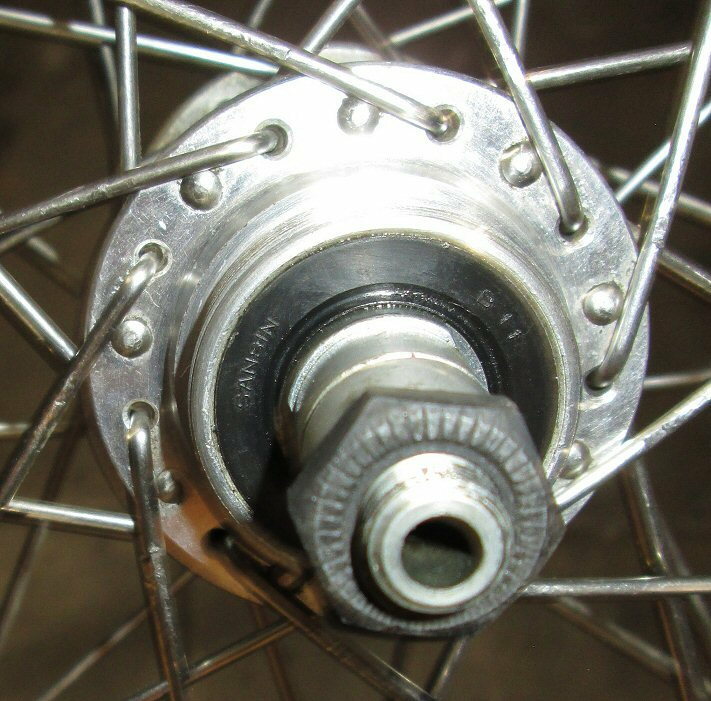 As some have noted, on some bikes with thin dropouts the axle can stick out and hinder the operation of the QR. Or you may have an issue with one of the volute springs in there collapsing or otherwise getting messed up and keeping the thing from biting down. Boutique hubs like your White are maybe more prone to this. Last edited by scarlson; 04-08-19 at 10:49 PM. 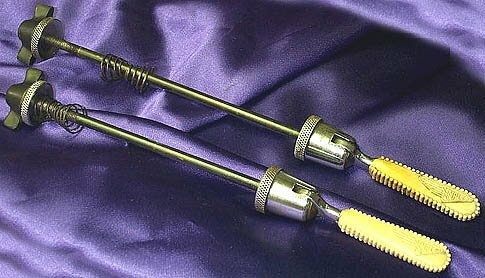 I'm not convinced screw type skewers hold better than a good internal cam skewer. I think a QR might be able to have an even higher force if you're willing to push down on the lever hard because the threads don't have to spin while tightening it. It's important that the QR nut and the wheel locknut have serrated steel surfaces though. Some skewers and wheels are just aluminum there and it doesn't bite into the dropouts. I think Surly also makes a tug for horizontal drop outs that comes with four integrated bottle openers that will get encrusted with mud and grease if you're into that kind of thing. Is that when you went 126 to 130? A shop isn't going to let you ride with the old 126 because the odds are goo that not al the nut threads would be engaged with the now too-short QR skewer. 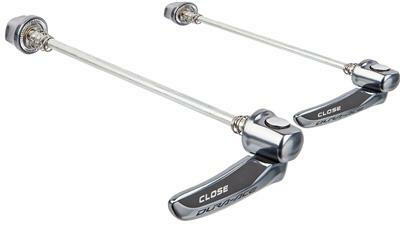 I fully second getting any Shimano 130 skewer with a steel skewer and asymmetric lever (ie internal cam). 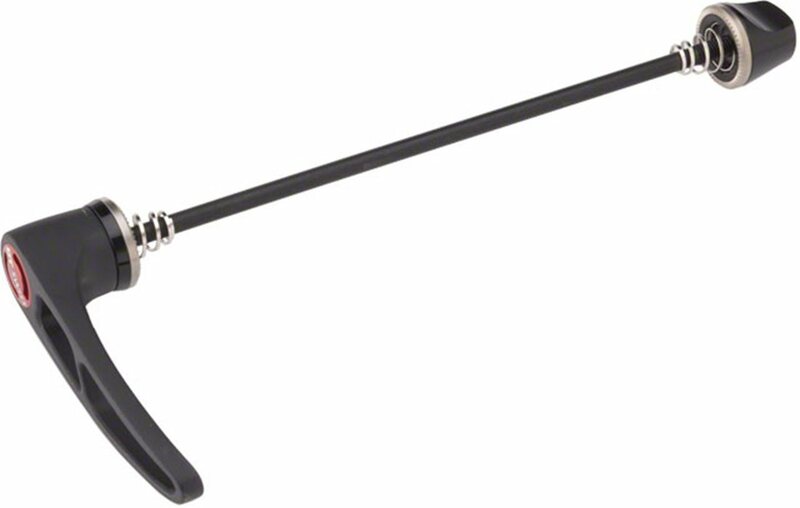 To my (limited) knowledge, all SHimano skewers are steel skeweres and asymmetric. No one has talked about non-steel skewers (titanium and aluminum), but they are marginal at best on horizontal dropouts and worthless on a chromed horizontal dropout. 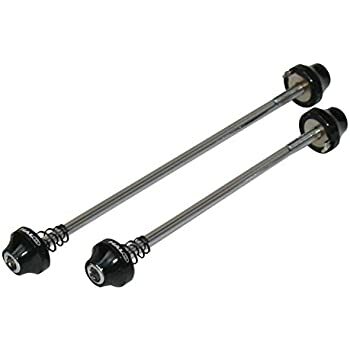 The reason is very simple, A QR has so only much take-up, ie so much stretch on the skewer, All skewers have the same diameter, the largest diameter that fits nicely inside the axle. The clamping force on the dropout can be shown with sophomore engineering math to be equal to the stretch times the diameter times modulus of elasticity and divided by the length. Now the modulus of elasticity is a function of the metal used. Steel is 30 million. Ti 15 milllion, Aluminum 10 million. Since you cannot change any of the other factors, that modulus decides how much your QR can clamp. Steel is the best by a factor of two. I have one bike with vertical dropouts and 12,000 miles. Every other bike I have ever owned has had horizontal dropouts. Vertical dropouts were standard for Peter Mooney when I ordered my frame. I requested horizontal so I could run fix gear without issue later if I wanted. Good serrations on the steel nut and clamp assembly (as pointed out in post #44 ) is very important since you are running the very hard and slippery chromed dropouts. This rules out some of the more expensive dropouts and more than a few with poorly designed or executed nut surfaces, Look there carefully. I've had a rear wheel shift and lock up against the left chain stay a number times. On several occasions it happened as I was cresting a rise out of the saddle at slow speed. The bars turned fully to the right and I dropped straight down. It was usually after I had taken the rear wheel out for some reason and failed to tighten the QR enough. It's rarely happened with Campy QRs and hubs with deep serrations in the axle locknuts. Most frequently it's occurred with Shimano QRs with little or no serrations inside the faces. My suspicion is that they were designed for use with vertical dropouts where less pressure is required to keep the wheels from shifting. Earlier and later Shimano QRs with larger serrations don't have the problem. Atom QRs used on Normandy and Atom hubs plus Maillard QRs work well too. Sanshin (Suntour) rear hub showing serrations. The White hubs probably have smooth aluminum faces on the axle ends like most of the other light weight hubs which can have the same problem. Only the QR serrations dig into the dropouts. If the QRs are not tight enough then they can easily slip. The WORST QRs were the ones made by Simplex in the 60's and early 70's. They came on a lot of French bikes including PX-10s. The "snap over center" levers could be tightened either direction but would not hold well the wrong way. Also a lot of riders would use the levers to screw them tight which didn't work well either. Some of them had chrome plated steel levers. 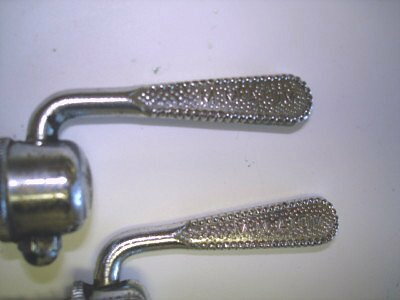 During the bike boom there were some that had levers made out of some kind of cast pot metal that were prone to breaking at the pin hinge. They were discontinued about 1973, probably because of liability issues. When bikes came in for service with those QRs we'd throw them away and for $5.00 replace them with Atom QRs. Last edited by verktyg; 04-09-19 at 12:33 AM. You have the wrong dropouts. I have these coming in the mail shortly. One should be able to loosen the quick release while riding, pedal, and it keeps the wheel straight. Then, tighten up the quick release, all while still riding the bicycle. And, I think the hook in front should keep the wheel from falling out as one can't pull it forward out of the slots. Don't ask why it has the cable stop... completely unnecessary. As far as the horizontal Campy dropouts, I get my quick release leavers TIGHT... and it has been years since I've pulled a wheel forward. Although, I had a slight problem with my Funny Bike. Tire clearance was so tight that a shift of a mm or so forward in the slots was bad. So, I found that it helped to pull the QR back when tightening it down, so the QR shaft was tight against the axle on the right side. I think I was playing with lightweight QRs, and went back to the basic steel ones. I have an old low-end mountain bike that used to have a chronic problem with the rear wheel slipping in the drive side dropout. Problem turned out to be that the drive side dropout was tweaked and not quite parallel to the non-drive side. After straightening it out the wheel stopped slipping. OK. As mentioned by others, some skewers are better than others. The rear wheel can shift if you're not careful even with good quick releases. Anyone using Paul QR? I considered splurging on these, but the alloy ends gave me pause. Then again alloy skewers worked OK BITD, mostly. I have alloy VO QR on another bike, the ones that look like old Ofmega/Avocet. Unfortunately they were just discontinued. verktyg - I used to like those Simplex! Never had a problem with mine. I guess I was lucky. I must have not had the pot metal levers, and never figured out that the levers would sort of work backwards. They were on my commute PX10 for years and the bike used to get locked up all the time with the front wheel off. This was when 99.99% of people took it for a 'worthless' UO8.